Xi'an (pronounced "she arn" and meaning "Western Peace", i.e. 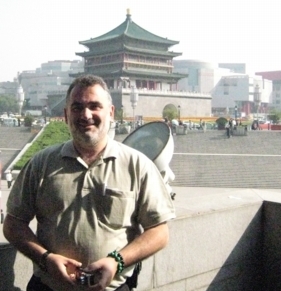 the peace imposed by the rulers in the West) is the Capital of Shaanxi Province. 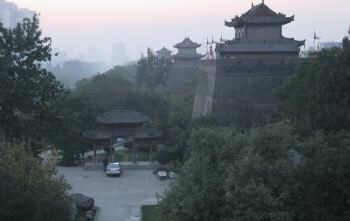 Xi'an is China's only remaining walled city. 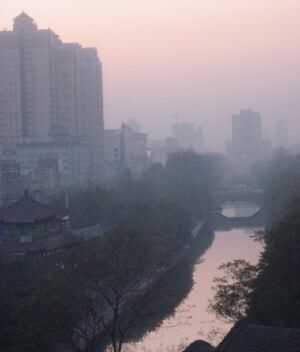 Xi'an is 28 km to the south east of Xianyang. 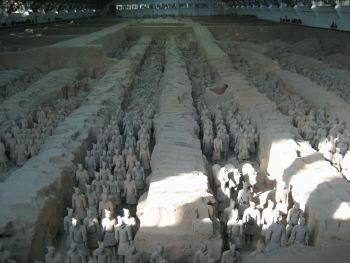 The Terra-cotta Warriors are a further 20 km. 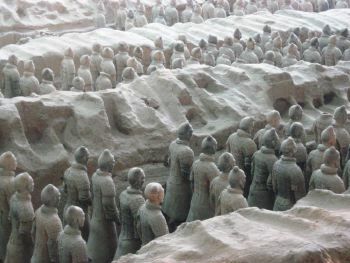 Because Xi'an is the nearest city to the Terra-cotta warriors most visitors think of them belonging to Xi'an, but in fact they belong to Xianyang which was the Imperial Capital of Emperor Qin Shihuang whose Mausoleum the entombed terra-cotta army was to protect. The Mausoleum was built during the Emperor's lifetime at a distance of 50 km from his Capital in an auspicious location. 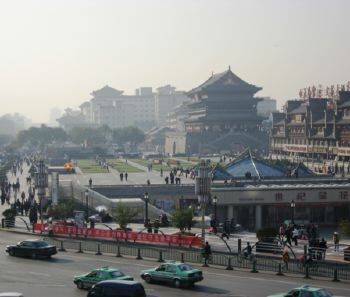 At that time Xi'an didn't exist, but in the meantime it has come into being and grown into a thriving city. 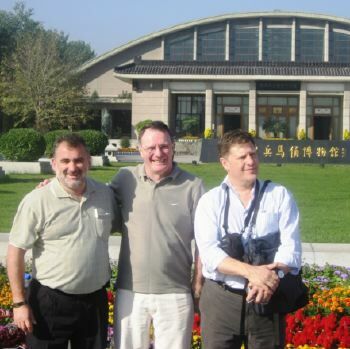 Adem, Robert and David at the entrance of the Museum of the Terra-cotta Warriors and Horses of Emperor Qin Shihuang. The hangar-like building in the background houses Pit 1, the first underground chamber discovered in 1979. The excavations of Pit 1 showing the reconstructed terra-cotta warriors, horses and chariots in Pit 1. Side view of the warriors. Rear view of the warriors. 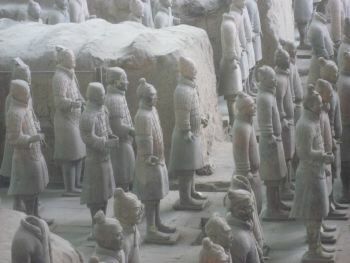 The earthern walls between the rows of warriors show the imprint of the roof beams which originally spanned the walls. Over time these roof beams rotted away and the roof collapsed down onto the terra-cotta figures. Jiaozi (pronounce "jow tser" as in cow) is the chinese word for their dumplings. 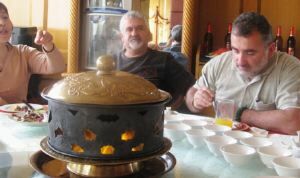 In China, Shaanxi Province is renowned for its jiaozi and in Xi'an there are famous restuarants which specialise in traditional Shaanxi jiaozi. The delegation had lunch at one of these restuarants on Day 3. 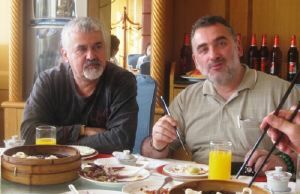 Being muslems, Anthony and Adem ate only vegetarian jiaozi. Men Ya Li giving a speech about the importance of the Moreland-Xianyang relationship. 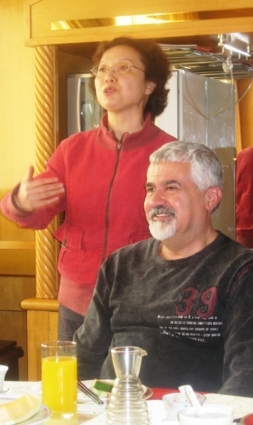 Ms Men is Deputy Director of the Xianyang Foreign Affairs Department. The Bell Tower (behind Adem) is close to the jiaozi restuarant in central Xi'an. It was built in approximately 1400 with a large bell inside for telling the time. The bell was struck on the hour which was the only way of knowing the time before clocks and watches. The Drum Tower is not far from the Bell Tower and was also built in approximately 1440. The drum was for announcing danger and so was struck on such occasions. 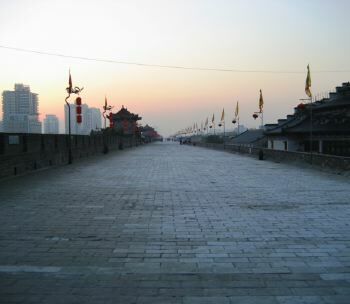 The existing wall was rebuilt during the Ming Dynasty (1368 to 1644). It stands 12 m high, is 12 - 14 m across at the top and is 13.7 km in length. There is a rampart every 120 m which protrudes out from the wall allowing defenders to see an enemy attempting to climb the wall. The distance between two ramparts is just within the range of an arrow shot. On top of each rampart is a sentry tower. View of the huge City Wall from the outside. Outside of the wall is a moat which made it more difficult for attackers. Today there is a treed park between the moat and the wall. The top of the City Wall was wide enough for a number of chariots and horses to be driven side by side. There are battlements along the top of the outer edge of the wall. In plan, the wall was rectangular in shape. In each of the four sides was a fortified gate which were closed at night. 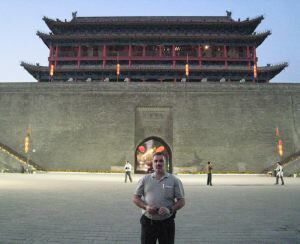 Here Adem is standing within the southern gate in front of the Gate Command Post.